The cover of Elizabeth Gilbert’s The Signature of Things. Photo courtesy of The Viking Press. Bookworm takes a look at books (old and new) with a garden-, outdoor- or nature-related subject matter or storyline. 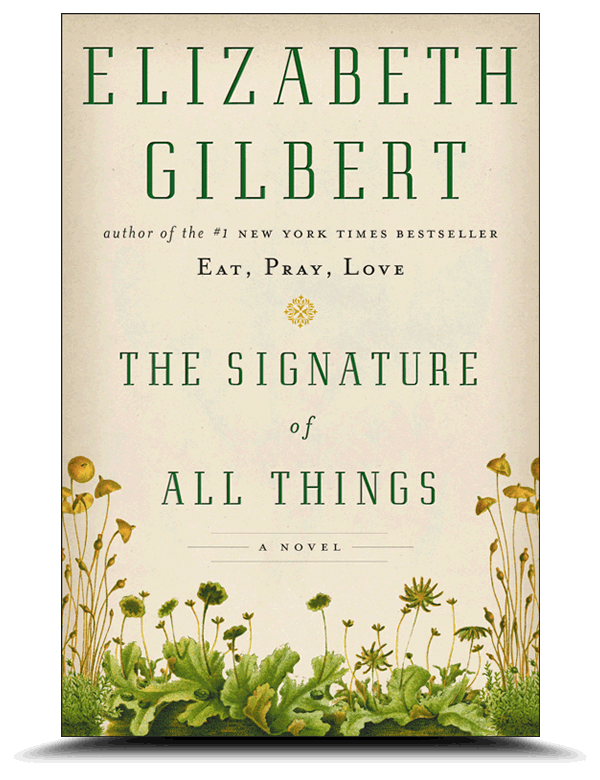 In this tome, Elizabeth Gilbert, author of Eat, Pray, Love, approaches storytelling with depth, spirit and plant life in her latest novel, The Signature of All Things. 501 pages. Hardcover. Viking, 2013. $28.95. Inspired by the author’s newly developed love of gardening, this novel tells the story of Alma Whittaker, the daughter of a Dutch mother from a horticultural family and British father, Henry, a self-made botany tycoon who made his fortune cultivating and selling rare medicinal plants from South America. Physically unremarkable but innately curious with her parents’ interest in nature, Alma’s childhood was spent with her feet wandering the woods and greenhouses of the family’s thousand-acre Philadelphia estate, her hands soiled with earth and her eyes divided between a microscope lens and the pages of books on plants. Eventually, after her crush on a fellow botanist goes unfulfilled—while her pretty and elegant adopted sister has a host of suitors—Alma dives headlong into her studies and writings, becoming a specialist in bryology, the study of mosses. Though she eventually finds love, she also finds herself so drawn to a mystery that takes her around the world. Alma’s discoveries lead her to develop the so-called “Theory of Competitive Alteration,” which describes how mosses evolve to survive changing environmental conditions. Not only does Alma cement her place among the giants of science, through her research, travels and life experiences, she learns much about the world, human nature and, most importantly, herself. A riveting read, The Signature of All Things is a brilliant, page-turning epic—part sumptuous 19th-century tale ala Dickens, part rigorously researched, fact-filled scientific notebook—that showcases Gilbert’s extraordinary ability to inventively tell a story with grace, intelligence and subtle humor, all while demonstrating a masterful balance of fact and fiction spanning botany, biology, history and adventure. Available for $17.37 on Amazon.com. This entry was posted in Book Reviews, Uncategorized and tagged Alma Whittaker, botany novel, Eat Pray Love, Elizabeth Gilbert, garden novel, gardening novel, The Signature of All Things. Bookmark the permalink.